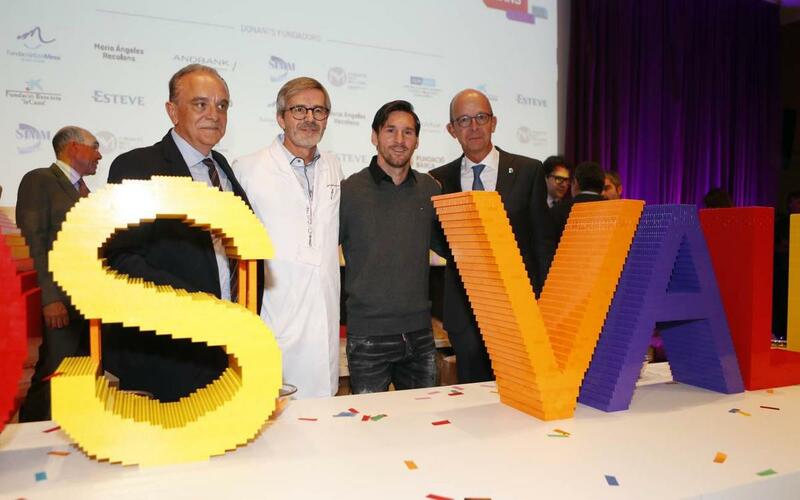 Jordi Cardoner, first vice-president of the Barça Foundation, and Leo Messi, captain of the FC Barcelona football team, attended an institutional event today to lay the first stone of the SJD Pediatric Cancer Center Barcelona in the Education Building at the Hospital Sant Joan de Déu. The ceremony also featured private donors, companies and various entities that had spent the morning building a sculpture out of 100,000 Lego pieces, spelling out the words “PARA LOS VALIENTES” (FOR THE BRAVE) that will stand in the new center's lobby when it is finished. A surprise during the event came when Mr. Cardoner announced that the Leo Messi Foundation and the Stavros Niarchos Foundation (SNF) had donated the remaining €2.6m needed to reach the required €30m in construction costs for the SJD Pediatric Cancer Center Barcelona. The announcement, made in conjunction with SNF director general Panos Papoulias and Messi himself, drew applause and tears from many of those present. The Stavros Niarchos Foundation has worked with the Barça Foundation for over a year on a refugee programme, and from there the #ParaLosValientes initiative came to prominence. The SNF made a first donation of €5m. This was added to by the contribution made with the Leo Messi Foundation today, to reach the required €30m. The new center will become a reality thanks to the thousands of donations received from the general public. It would not have been possible without the contributions made by the ten founding donors of the project that, besides providing important financial support, also form an advisory board that will oversee its development. These founding donors are the Barça Foundation, the Leo Messi Foundation, Mª Ángeles Recolons, Stavros Niarchos Foundation, La Caixa Bank Foundation, Andbank, Esteve, Fundació Nou Mil·len, Simm Medical Image Group and a tenth donor that has preferred to remain anonymous. Since February 2017, the date when the fundraising campaign was launched to build the largest pediatric oncology center in Europe, ​​€30m have been collected. This is the highest amount ever raised by the general public in Spain for such a project. The SJD Pediatric Cancer Center in Barcelona will be able to attend to 400 patients per year, some 30% more than the Sant Joan de Déu facility is currently able to handle (215 new cases each year and 70 cases of relapses or second opinions), and incorporates the latest advances in the fight against cancer. Building work will last for two years and the center is scheduled to open in the second half of 2020. Sant Joan de Déu is dedicated exclusively to maternal-infant attention, and is a standout facility in Spain for its treatment of different types of tumours. It is the hospital with the most cases of childhood cancer attended to in Spain (and amongst the leading hospitals in Europe).